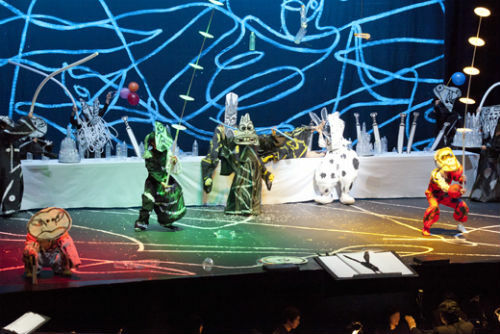 A scene from the Korean pansori opera Sugunga (English title: Mr. Rabbit and the Dragon King), performed at the Opernhaus Wuppertal theatre in Wuppertal, Germany (Photo: Gonggam Korea). Kim Sang-sul, head of Marketing and Public Relations for the National Theatre of Korea, recently returned to Korea after heading the first European performance tour by the National Changgeuk Company in Wuppertal, Germany. In the following article, originally published at Gonggam Korea, Kim shares his reflections on the experience. With K-pop spearheading a new chapter in the worldwide spread of Hallyu, more and more people are showing a deeper interest in Korean culture, one that goes beyond the bright lights and celebrity buzz. It is this subtle redirection “back to the basics” that gives me hope that traditional Korean culture will reach a wider audience in the foreseeable future. Last month, I traveled to Wuppertal, Germany, with a 68-member team from the National Changgeuk Company of Korea, for the first-ever international performance of the Korean pansori opera Sugungga, known in English as Mr. Rabbit and the Dragon King. The prospect of seeing one of our traditional operas play out on the stage of the Opernhaus Wuppertal theatre, the creative birthplace of legendary German dancer and choreographer Pina Bausch, was enough to take my breath away. Before opening night, I was understandably nervous about what kind of reception awaited our show. But for me and the rest of our team, the fact that Opernhaus Wuppertal management had gone to great lengths to open a space for us on a tight calendar that often requires two years’ advance booking was an honor in itself. We were grateful for the opportunity to introduce Korea’s 400-year-old pansori tradition and 120-year-old changgeuk opera legacy in a city that currently boasts Germany’s liveliest art scene. The response by the audiences was overwhelming. From December 21 to 23, each show of our three-day tour opened to sold-out crowds. The standing ovation that inevitably followed each night’s closing act continued long after the curtain fell. Fixed on the spectacle onstage, audience members made no move to leave their seats during the show, despite the three-hour running time. The titters and collective bursts of laughter that punctuated the performance in all the right places also left me amazed. The quick banter and satirical jabs in changgeuk opera can be difficult for even Koreans to follow, but the enthusiastic reactions by the Wuppertal crowds and their appreciation for the humor laced in each flashing subtitle convinced me of the genre’s universal appeal. A packed audience waits for the show to begin at the Opernhaus Wuppertal theatre in Wuppertal, Germany (Photo: Gonggam Korea). Local media outlets also zeroed in on the show’s remarkable success. The Westdeutsche Zeitung described the story and characters at length under the headline, “Korea’s Hare Hunter Brings Zest and Wit to the Stage.” German public broadcasting station WDR brought viewers footage of performance rehearsals and also interviews with stage director Achim Freyer and house manager Johannes Weigand discussing the opera’s artistic merits. Representatives from opera houses in neighboring Frankfurt, Hamburg, Mannheim, Basil, and Dortmund also tracked us down to express interest in bringing Sugungga to their cities. Our tour also marked a significant occasion for cultural exchange between Korea and Germany. Several hundred guests, including the secretary of cultural affairs for the North Rhine-Westphalia state, the chief of Wuppertal’s Bureau of Cultural Affairs, the consul general of the Korean embassy in Germany, and the director of the Korean Community Association of Germany attended the commemorative gala and the pansori presentation that took place in the days leading up to opening night. The fact that Sugungga enjoyed such success during its short run, in a city with fewer than 100 Korean residents and no Korean community association to its name, must be attributed in part to the efforts of acclaimed director Achim Freyer and his passion for pansori. For three packed months, Freyer labored alongside our actors and crew with an energy and contagious zeal that belied his 77 years. From the outlandish masks donned by the animal characters to the plastic bottles dangling from the ceiling, each detail of the production spoke to Freyer’s artistic vision. The end result was a true feast of sights and sounds, with each scene framed by neon backdrops, striking costumes, and rhythmic melodies produced on traditional Korean instruments. Freyer infused Sugungga with a modern stylistic polish that only amplified the raw dramatic power of the pansori form, appealing not only to German opera goers’ penchant for the familiar but also their taste for the fresh and provocative. Aurally gratifying and emotionally riveting, pansori has given voice and cathartic release to the laments of the Korean people for over 400 years. On the occasion of its rebirth as an operatic medium with the potential to connect people from all over the world, I would like to invite Koreans too to rediscover the magic of this most “Korean” of Korean art forms. Pansori’s path to the world’s stages will be lined with our collective efforts.